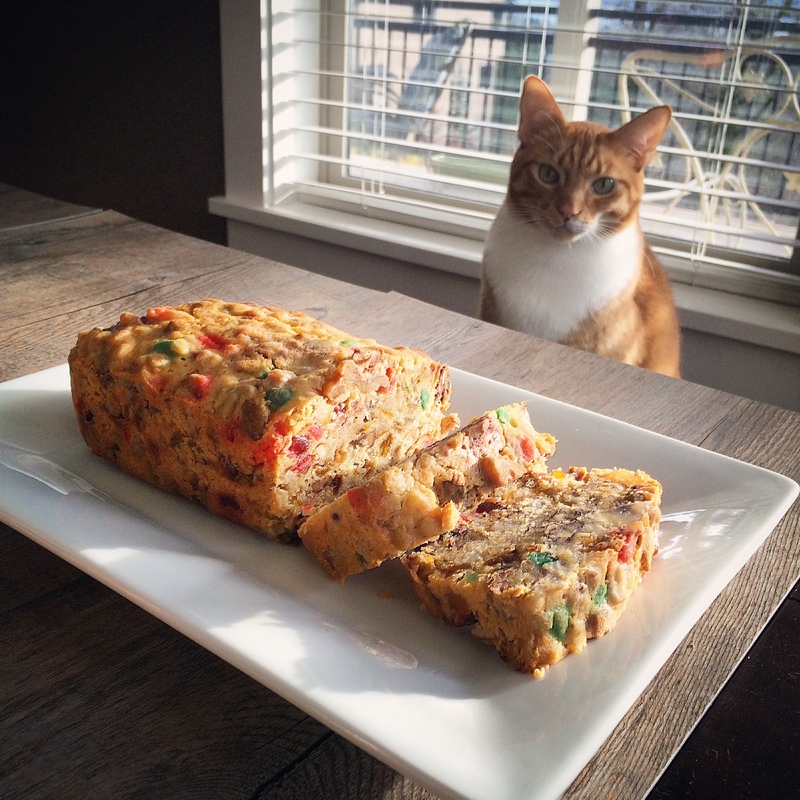 Don’t ask about the cat…He was apparently going through a fruitcake phase as well. Anyways though, I was a tad skeptical about these cookies. 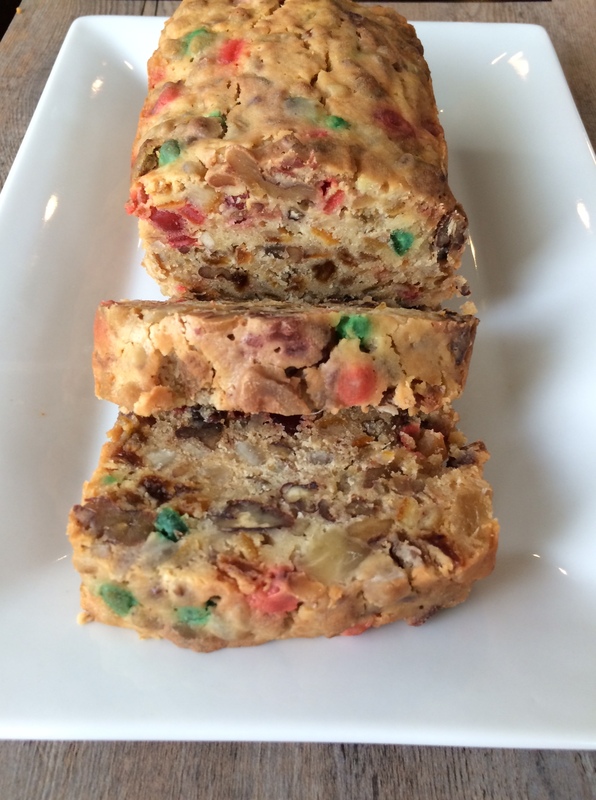 I hoped they would be lighter than actual fruitcake while I was letting the fruit soak in some booze. 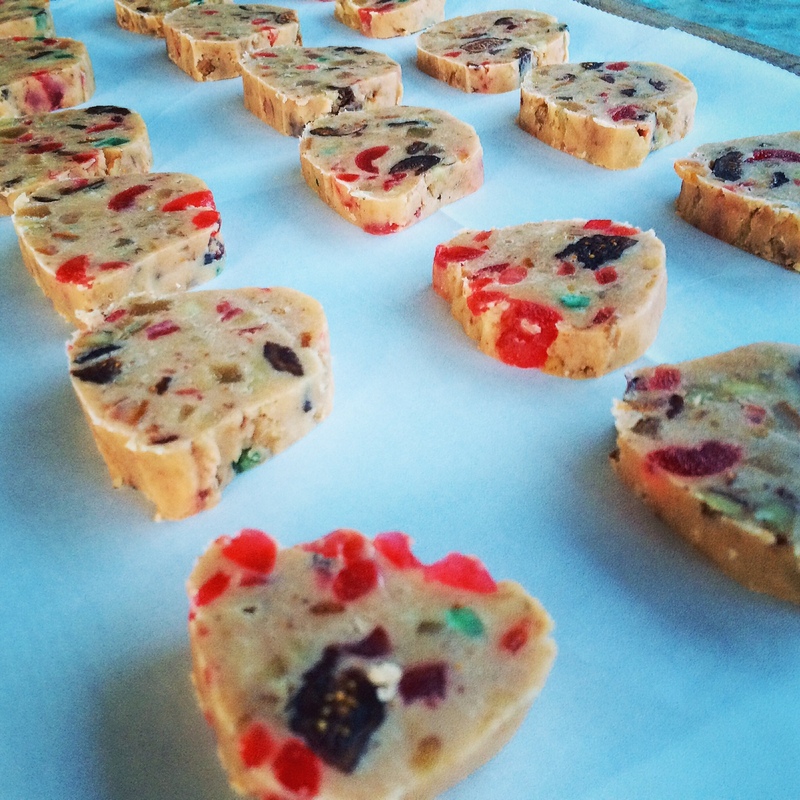 I hoped people would actually want to eat them…and they turned out great! 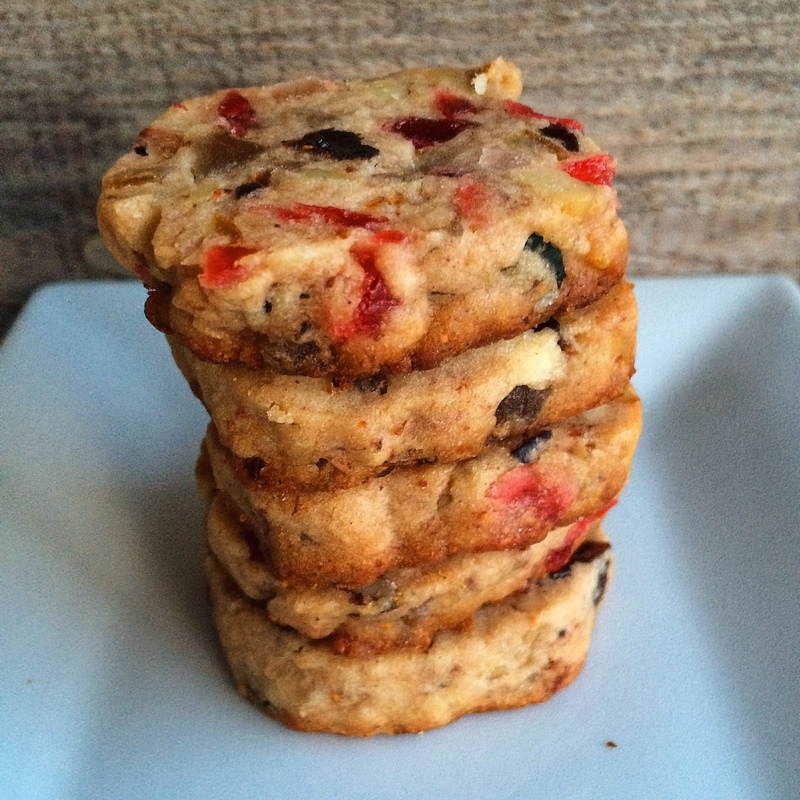 They are not the prettiest cookie in the world…Sort of like the ugly duckling of cookies, not too cute, but once they hit your lips…so good! They are easier to make than fruitcake, updated with figs and candied ginger, and you don’t have to wait around for them to soak in the booze for a few weeks, only a few hours. 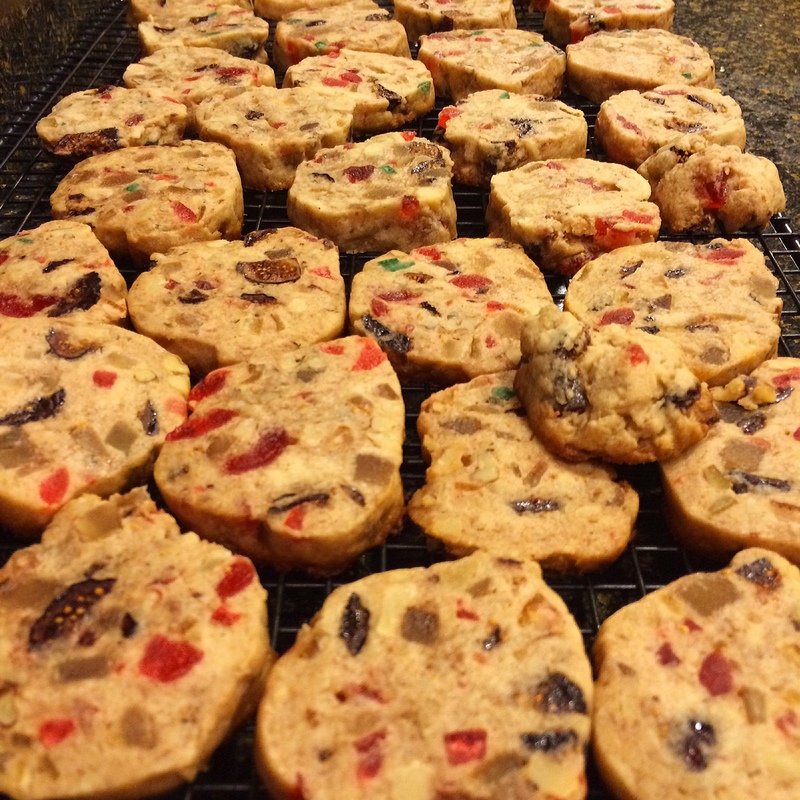 I could see kids not being too thrilled about these holiday cookies, they remind me more of an adult breakfast cookie…and at this time of year, they are probably the best cookie you could eat for breakfast. Hey…they have real fruit in them! And so it goes. 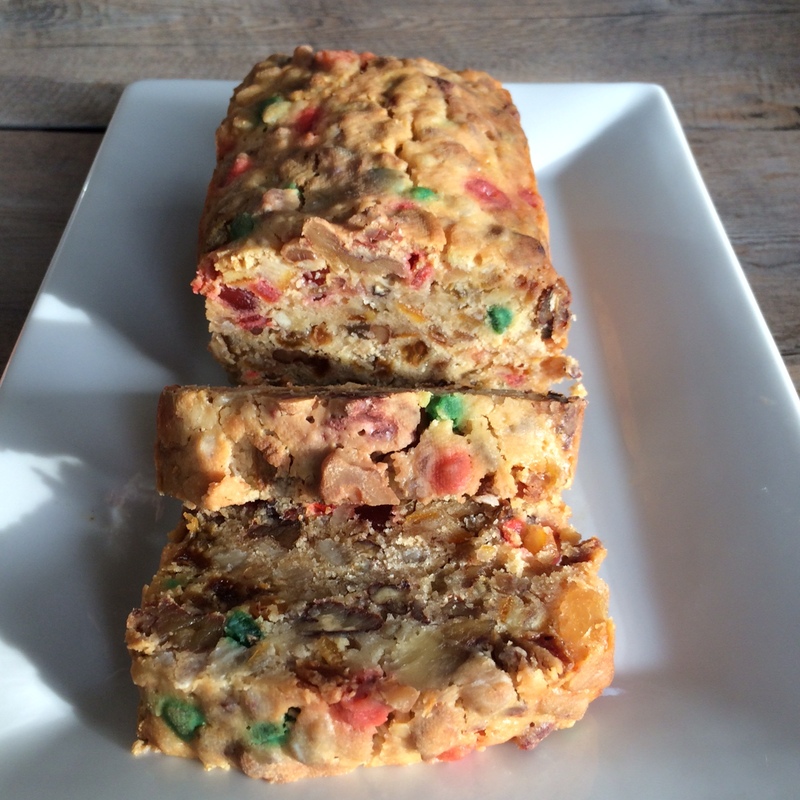 This holiday season I went through a fruitcake phase. Last year, I went through a Christmas Balls phase…and a candied citrus peel phase. 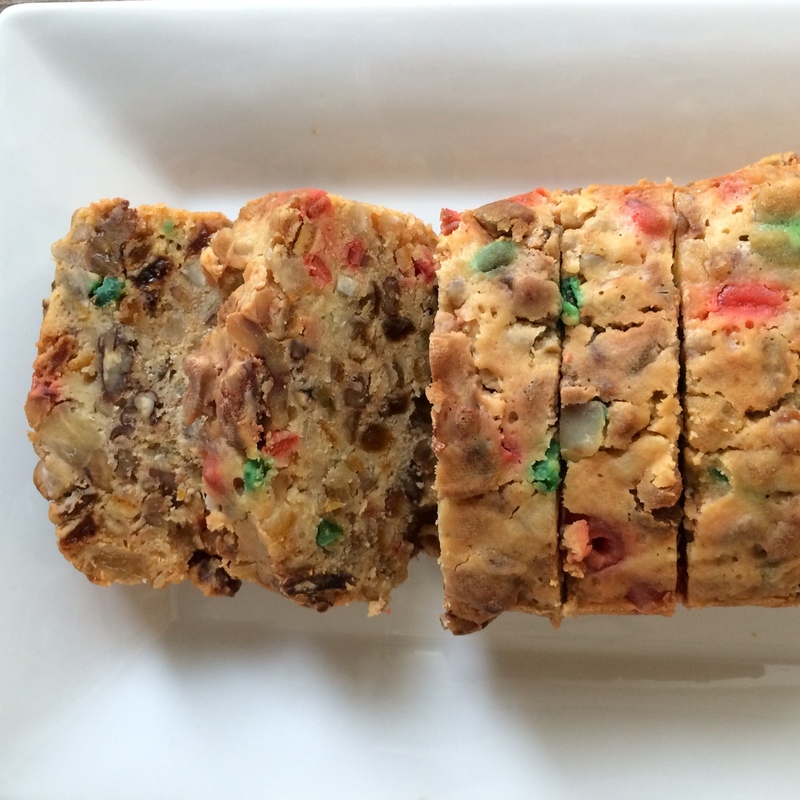 It was amazing, and I wish I had time to make them all again this year…but I had to tackle fruitcake once and for all! Snip off the hard stems of the figs with scissors or a small knife and coarsely chop the figs. 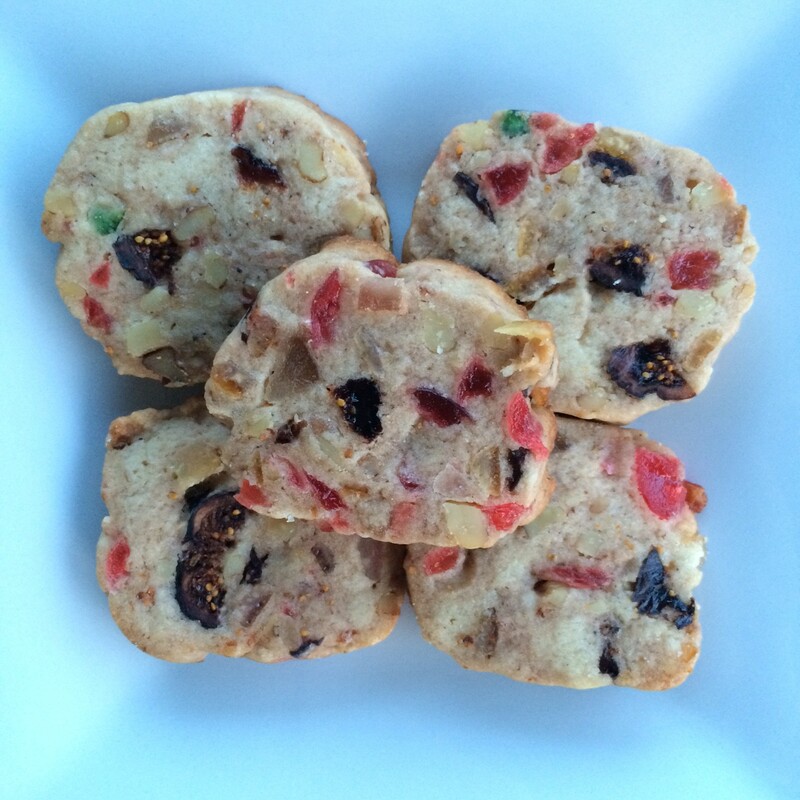 In a medium bowl, combine the figs, cherries, ginger, and fruitcake mix. Add the honey, brandy, lemon juice, walnuts, and a pinch of salt. Give it a good stir. Cover with plastic wrap and allow to sit overnight at room temperature. I did mine in the morning and got to baking that evening – a good 6-8 hours should do the trick! In the bowl of an electric mixer fitted with a paddle attachment, cream the butter, cloves, vanilla extract, sugar, and brown sugar on medium speed until smooth, about 3 minutes. With the mixer on low speed, add the egg and mix until incorporated. With the mixer still on low, slowly add the flour and 1/4 tsp salt and mix just until combined. Don’t overmix. Add the fruits and nut mixture, including any liquid in the bowl. Divide the dough in half (or thirds, in my case as I was using smaller sheets of wax paper), and place on the long edge of a piece of parchment or wax paper. Roll each half into a log, 1 1/2 to 1 3/4 inches thick, making about and 18 inch long roll. 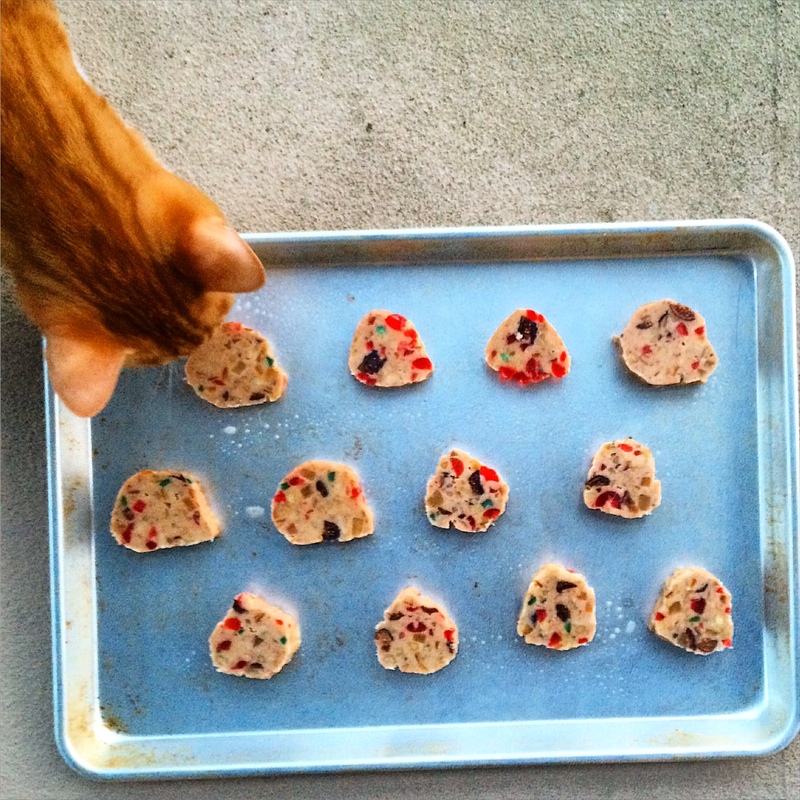 Refrigerate the dough for several hours, or until firm. Preheat the oven to 350F. With a small, sharp knife, cut the logs into 1/2 inch thick slices. Place the slices 1/2 inch apart on greased sheet pans and bake for 15 to 20 minutes until lightly golden. In a large mixing bowl combine 1 cup white raisins, 1/2 cup sliced citron, 1/2 cup sliced lemon peel, 1/2 cup sliced orange peel, 1/4 cup chopped candied pineapple,1 cup shredded coconut, and 1 cup chopped almonds or walnuts. Sift together 2 1/2 cups cake flour,1 tsp baking powder, and 1/2 tsp salt. their falling to the bottom during the baking process. Cream together 1/2 cups butter, and 1 cup sugar. Beat 3 whole eggs and 1 egg yolk slightly and add to creamed butter and sugar. Flavor the mixture with 1/4 cup Brandy,2 Tablespoons Sherry, and 3 Tablespoons of orange juice. Blend the mixture well and stir into the floured fruits. Pour batter into 3 buttered baking pans lined with buttered paper and bake in a very slow oven (ie: old school saying for 250 degrees) for 1 1/2 hours, or until cakes shrink from sides of pan. This recipe makes 3 one pound loaves. They may be wrapped in brandy or rum soaked linen and stored to ripen for about a week.